Lower demand for gas at the end of the summer driving season is helping drive the price of gas lower as we move deeper into August. The weekly gas price survey from the U.S. Energy Information Administration shows the price of a gallon of regular unleaded dipped just over three cents per gallon last week, pushing the average cost for retail gas to only $3.47. That is the first time since the beginning of March that the national average price has been under the $3.50 mark. The nationwide average from the March 3, 2014 survey showed fuel at $3.48 per gallon, a penny higher than this week’s average. Paying a toll: Prices at a Wag-a-Bag station near Capital of Texas Highway and Westlake Drive in Austin on August 7, 2014. 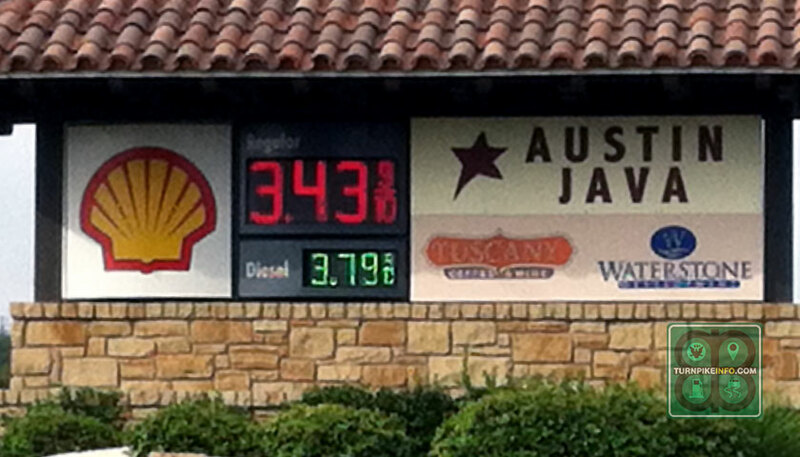 Prices at stations adjacent to or on toll roads are typically higher than their regional averages. Photo: Kristen Scallion. Prices dropped in all regions, except for the Rocky Mountain states, where prices have been holding steady or moving upward slightly. In the Midwest, which was hit with a substantial increase last week, prices fell by nearly six cents, which was largest weekly decline of all the regions surveyed. The Gulf Coast region remains the cheapest place to get gas. 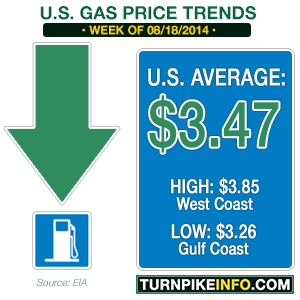 The price of a gallon of unleaded registered at just $3.26 in this week’s E.I.A. survey. For truckers, the news is not quite as dramatic, in terms of weekly of the weekly price comparison. The average cost of a gallon of diesel, at the national level, is $3.84, although many truckers are paying well more than $4.00 per gallon along the West Coast, particularly in California. However, the price of diesel has been steadily declining through most of the summer, and average prices this week are at the lowest levels they have been since a week before the 2013 Thanksgiving holiday. West Texas Intermediate crude continues to trade under $100 per barrel. Prices closed Monday at $96.41 per barrel for September delivery, on the the New York Mercantile Exchange. However, prices started out slightly higher in early trading Tuesday. Meanwhile, Brent Light Sweet crude, the overseas benchmark, was going for about $102 per barrel, but that price point is the lowest Brent has been in 14 months. Both futures indices tumbled two weeks ago amid reports that the U.S. continues to produce enough oil to offset supply issues in other areas where geopolitics have been getting in the way of production. Additionally, a fire at a U.S. refinery on July 29 also triggered a futures selloff. However, short-term speculation is pushing WTI higher in advance of two reports this week that will detail consumer demand and the current fuel supply. With refineries operating at a slightly reduced capacity, many investment analysts are projecting WTI will rebound further, but none is predicting it will go over $100 per barrel again. Bloomberg.com quotes Michael McCarthy, the Chief Strategist at CMC Markets in Sydney, Australia, who predicts many investors will start selling off contracts if WTI moves to about $98.50 per barrel. Such a selloff would stop the September delivery contract from pushing higher.